So I know that most of you are waiting for another AMAZING expert interview, but this week, we decided to switch it up! We know you want the industry inside scoop, we get it. Which is why we have decided to pool all the amazing insights from our 10 weeks of interviews (yes 10!) to bring you this all-inclusive social media expert mash up! Also Read: Do We Really Need Twitter Polls? What Is Your Personal Favourite Social Media Platform? 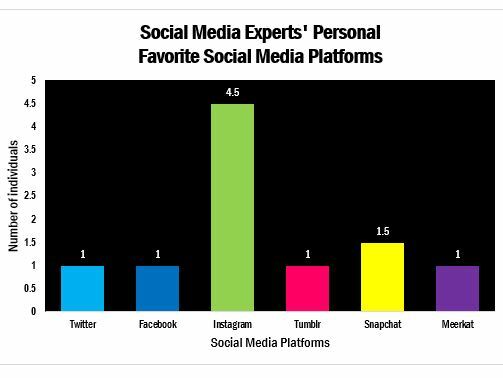 While the answers varied across the board, almost half of them are fans of Instagram. So I guess it’s safe to say that the visual social network is here to stay. According to the experts we have interviewed so far, visual social networks are winning! Which Platform Is Most Used By Your Company? While this question was home to a couple different answers, the experts uncovered that, as far as the real truth is concerned, well, there isn’t one and for a good reason. In fact, a lot of companies that are involved in social media, experiment with a variety of social media platforms. While it might not be a cheapest strategy, it’s pretty full proof when it comes to extending your reach. By focusing on one sole platform, you not only lose the reach, but you also lose the biggest opportunity to engage with a variety of users/consumers. Buzzfeed puts its attention on experimenting with a variety of platforms, thus making it much easier for their content to both go viral and reach the proper readers.
.@AntoniaHeslop: at @Buzfeed we believe a variety of platforms is the best way to extend your reach. Another thing you also have to take into consideration is a mixture of other parameters as well, like the fact that each individual target market has a favourite social media platform. Millennials love Snapchat and Twitter, while the baby boomers (nearly 30% of the UK population) hold onto Facebook. Therefore its not surprise that a lot of companies still rely on Facebook for its ease of social interaction.
.@mattjukes: Your strategy should come down to: Who do you want to talk to? Where are they?
. @victorpineiro: successful campaigns are ones that socialize and start a conversation. How else do you retain consumers? You build a relationship with them. Engagement plays a major role in the B2C relationship. Brands are joining the social media platforms, and with that come expectations of discussing with the consumer and building upon not only the brand image, but the brand experience. However, when it comes to the most important KPI, the answer is not definite, as all experts agreed that it is relative to each individual campaign/client. What might be important to one campaign, might not be as important to another. You don’t want to focus on “likes” if you’re trying to generate new purchases. Your focus lies within the goals of each campaign developed by the client or the brand themselves.
.@jarroddicker: What’s great about KPIs in social is that raw data, allow to craft a unique story. And the future… well thanks to Periscope, Snapchat and Meerkat live broadcasting is here to stay, even though precise predictions are not concrete at this stage. Stay tuned for more weekly expert interviews and all things social media here at WeRSM.